In 2006, my little 10-year-old mind was blown to bits at the sight of a pack of wolves hunting down bison on the frozen tundras of Northern Canada in the first Planet Earth series presented by the BBC. My tiny eyes were exposed to wildlife footage of raw animal instincts. This was certainly nothing compared to the innocent images of elephants and caterpillars in my school’s science textbooks. After ten years, the award-winning BBC Natural History unit is back and has revolutionized the nature documentary game again, exposing our world’s hidden wonders this time in Planet Earth’s 2016 sequel Planet Earth II. 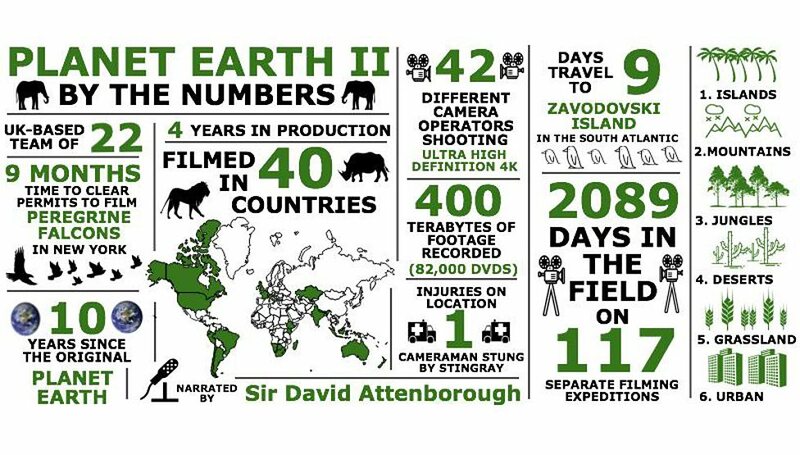 The sequel, shot in 4k-Ultra HD over 2000-plus days across 40 countries and with the help of advanced technological improvements to video capture devices like drones, telephoto lens, and high speed cameras to capture shocking new footage of the natural beauty around us on our blue planet. Our jaws dropped at the monkeys leaping from branch to branch in the first film. Now get ready for round two as BBC’s Planet Earth II – Live in Concert goes on tour across 23 countries, bringing breathtaking 4k-Ultra HD imagery paired with a live music to Prague’s O2 Arena on March 28th 2018. The 80 member City of Prague Philharmonic Orchestra, conducted by Matthew Freeman, brings Academy-Award winning composer Hans Zimmer’s unique cinematic score to life as the dazzling footage from Planet Earth II plays on the jumbo-screen above. I can promise you three things you will regret in life. One, not talking to that cutie in row five. Two, not telling your parents that you love them more. Three, not going to see Planet Earth II, live in concert. So, do NOT pass up this once in a lifetime opportunity for the Prague Philharmonic Orchestra to serenade you in sync with the stunning images of the natural biomes on this blue planet. Tickets prices range from 690 to 1,490 Czech crowns, which is almost less than the price of five Skinny Caramel Macchiatos at Starbucks. So my Ján-advice? Skip that sugary nonsense for a work week and put that good cash towards an experience that you’ll cherish for a lifetime!